Please follow these guidelines to ensure safe delivery of your items to your buyer. These are guidelines only and are intended for those who may not have a lot of experiencing shipping items through the mails. If you are an experienced mail-order seller, of course you have your own procedures and do not need to follow these guidelines if they differ from your own. Payment in Advance or Payment Upon Approval? All of the steps described below apply to shipment, which occurs after a sale. But what about payment? When do you get paid? The answer is that it is up to you to set these policies. You set your selling policies for each sale as you see fit. You should state in your ad what your policies are. If you require payment in advance of shipment, you should say so in your ad. Or, you may wish to ship to the buyer on approval and receive payment upon confirmation of satisfactory goods. If no such policy is stated within your ad, it is a matter of negotiation between you and the buyer to discuss and agree on these policies. If the buyer has impeccable credentials, a BBB rating, a Chamber of Commerce membership or can otherwise prove to your satisfaction that he or she is an honest and trustworthy buyer, you may decide to ship on approval. But that is a matter for you to decide. We do recommend, however, that you proceed with caution and always check business and banking references prior to "on approval" shipment of goods. Who Bears the Cost of Shipping? You may require a "Shipping Fee" or you may decide to offer "Free Shipping." Whichever you decide, it should be clearly stated in your ad, otherwise standard practice is to assume that the seller will pay for delivery. We highly recommend to all sellers that they offer FREE SHIPPING. It is a common practice among major e-sellers and truly increases sales. Remember, your goal is to make a sale, and free shipping is a strong inducement helping you to reach that goal. Personal or Company Check. Standard practice allows the seller to hold the check until it clears prior to shipment, although this can be a point of negotiation. Money Order. Guaranteed Good Funds, no need to hold a money order and no fear of the payment bouncing. PayPal. Owned by ebay, Paypal is the largest of the instant payment systems. They will take about 4% from the seller as a transaction fee. Wire Transfer. Some large-scale professional buyers can offer you same day payment via wire transfer for a small fee, usually $20-$25. Third Party Escrow. (available as an optional service from Soldster.com)is sometimes used for large sum transactions when the buyer is wary of paying first and the seller is wary of shipping on approval. In this method, a third party holds good funds for the seller and releases the funds to the seller when the buyer gives the OK. The third party is the assurance to the seller that good funds are "in hand." There is a fee for this service, payment of which can be a point of negotiation between buyer and seller. Normally, the seller (you) should state in your ad the forms of payment you will accept. Of course, you can always wait until you have an offer and negotiate it then. But, if you are a professional seller and have these things decided in advance, you should include the policy in your advertisement. I've Made A Sale, Now What? Step 1: Communicate, Communicate — Keep Your Buyer Informed! BEFORE shipping your items to your buyers, you should communicate with them to notify of your shipment plans. You usually do this by email. Consult your email notifications from Soldster or your My Orders dashboard within Soldster to get your buyer's email address, phone number, and shipping address. Buyers need to be aware of incoming packages and tracking numbers so they can arrange to be home or at their business location when the package arrives. Step 2: Box 'Em Up...Sturdily! Once you have notified your buyer of your shipment plans, we strongly recommended mailing your package using Insured Priority Mail with the U.S. Postal Service. FED EX or UPS are also OK but usually more expensive. If shipping via Post Office, obtain a free box called a Priority Mail Flat Rate Box from the post office. You can fill it with up to 70 pounds of items for a flat rate of around $10.00-$15.00 plus insurance. Be sure to insure your items for the full value. With Insured Priority Mail, you can insure a shipment for up to $5,000. If your transaction is worth more than this amount, you should use Registered Mail to fully insure it (the Smithsonian Museum in Washington D.C. ships rare valuables using Registered Mail, so it is very secure!). Secure your items inside a strong cardboard box like the USPS Flat Rate box. Use plenty of packing material so the contents don't have room to move around in the box, or bang into other items, during shipment. Use lots of heavy 2 inch Scotch Strapping Tape (available at Walmart, Walgreen’s and many stores) After taping the box(es) securely, make sure there are no old labels visible on the outside of the box. If there are, cover them up. Sometimes the Post Office will help you fix this by putting their own tape over the box when you're ready to mail it. If you're not sure, just bring the package to the Post Office and they'll help you out. 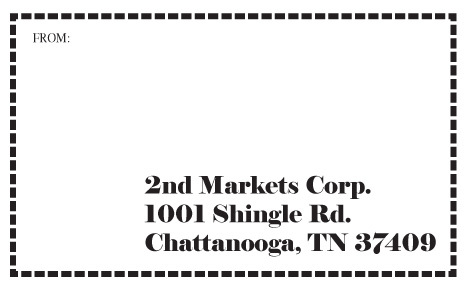 Use a mailing label (like the one shown below only with the buyer's address) and affix it to the outside of the box. You can also print a mailing label AND postage for free at www.USPS.com (The official United States Postal Service website). Once everything is packaged properly, it's time to go to the post office. Since you will need to buy insurance, you cannot simply give your package to the mail man. If you'd like to use a different shipping provider or carrier (other than the US Postal Service), it is OK but shipping costs will probably be much higher. To save yourself money, we highly recommend the US Postal Service. On the other hand, if you go to FED EX Office or the UPS Store, they will package your item(s) for you and do the whole job for one price including shipping and insurance fees. If shipping by Fed Ex or UPS, be sure to request GROUND SERVICE to save money. NOTE: Buyers are not responsible if your items are lost or damaged during shipment. If items are lost or damaged in the mail, your insurance will cover it. This is why it is so important to securely and carefully package your items in gorilla-proof packaging. It is VITAL that you include your full name, address, phone number, email, and details about the deal in a letter inside the package. Many sellers fail to include details INSIDE the package. You should always include a receipt or invoice INSIDE the package. Also, be sure to include an inventory list of the items you are shipping (or if you have been corresponding with a buyer through e-mail, enclose a copy of the last e-mail sent or received). Send your buyers an email message to confirm shipment has taken place. Provide them with tracking numbers (which the post office will give you). Unless specified in your advertisement, the Federal Trade Commission requires all mail-order transactions to offer a buyer "right of return" privilege in the event of unsatisfactory goods. Typically, a buyer has seven days after receipt of your package to notify you of any problem. The buyer may, at his or her option, return the item for a full refund. It is, therefore, a good idea to not spend the money until you have heard from the buyer. You may include a statement in your ad such as "Absolutely No Returns Accepted!" however we highly discourage this because such statements are typical of internet sccams and make you look like a crook. If you make such a statement, you should include a clear statement explaining the reason for the "No Return" policy. Therefore, as a matter of sound business policy, we highly recommend having a final communication stream with your buyer. Did you receive the item? Are you happy? We appreciate your business. Etc. Etc. After the sale is completed, both the buyer and seller should go into the Soldster My Orders dashboard and post feedback, positive or negative. We highly recommend taking the time to do this and also asking your buyer to do the same. This enables you to build your online reputation and does the same for the buyer. A 2nd Markets Web Property ©1999-2015 2nd Markets Corporation.. All Rights Reserved. Designated trademarks and brands are the property of their respective owners.